WAAAAGH! Pt.4: GorkaMorka Slaver a.k.a. Ork Runtherd (1998) | Azazel's Bitz Box. 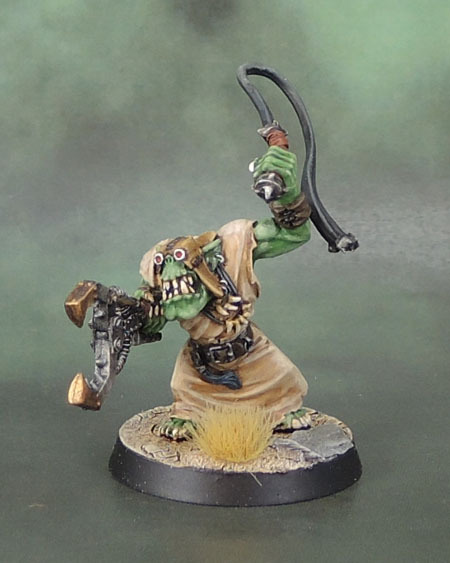 This entry was posted in 40k Orks, GorkaMorka Models and tagged 40k, Brian Nelson, Gorka Morka, Ork Slaver, Orks, Runtherd, Warhammer 40000, Warhammer 40k. Bookmark the permalink. Great work. Gorkamorka is responsible for some very fine Ork miniatures. Interestingly it is also, in my opinion anyway, almost singlehandedly responsible for defining the space Ork aesthetic as crude techno barbarians driving mad max style through a desert wasteland which they have had ever since. 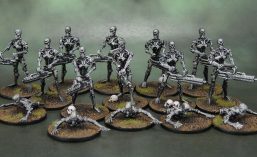 Before that they were brightly coloured jungle dwellers, as was everyone in the 41st millennium. It’s interesting because such an unsuccessful product has had such an ability to define the orks so powerfully. 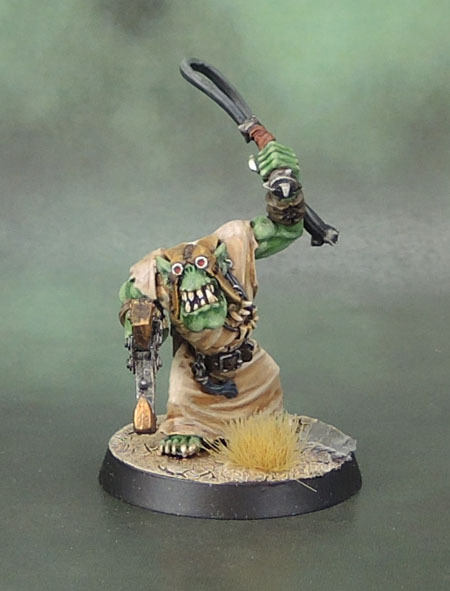 Anyway, great work in this model, looking forward to seeing the grots. 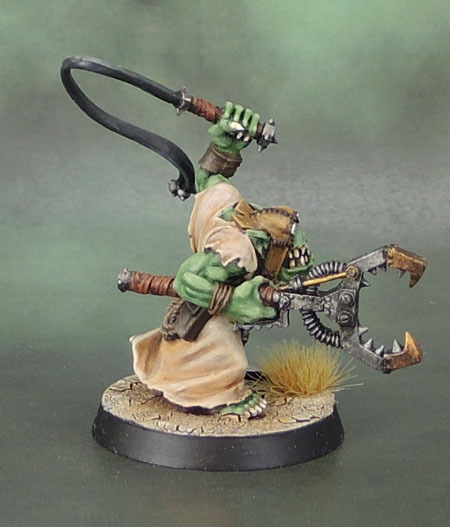 Thanks mate – GorkaMorka certainly subverted what late-Rogue Trader and 2nd Edition had turned the Orks into – going back in many way to some of what made the early-RT Orks so special (to me, anyway). Bringing back more of the “feel” than the look of those first models. They absolutely brought back the Mad Max influences, and cranked them up to 11, while also doing the whole desert wasteland thing as well. Just a shame that Gorka never took off in my area, but I’ve just remembered that I have a whole lot of the humans half-painted somewhere. I should (find and) finish them. 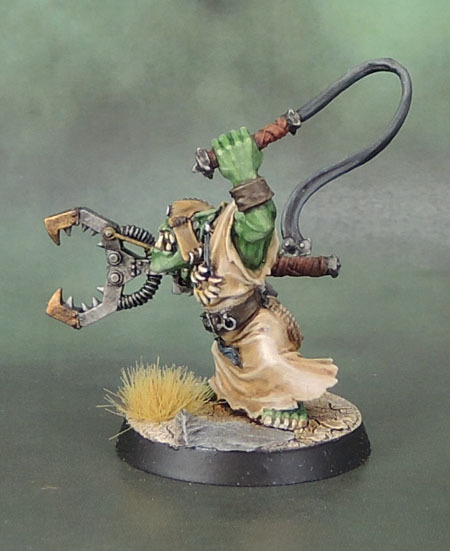 Maybe I can use them as slaves (Grot stats) as well! 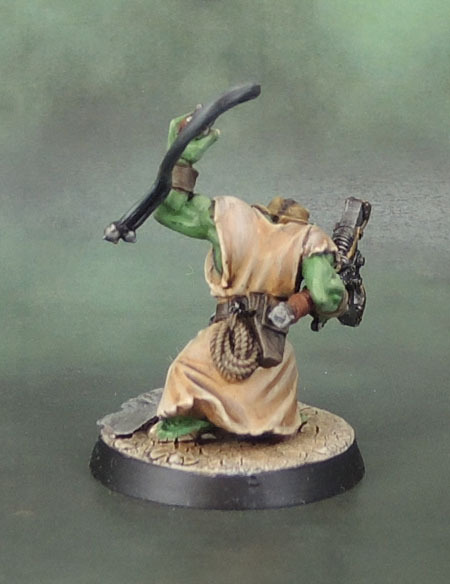 Though they are painted with African skin tones because I was going for the Sub-Saharan desert skin tone thing, and because I was railing against GW of the time BECAUSE NOT EVERYONE IS BLOODY WHITE! (Hey, my Tallarn are painted with arabic-brown skin tones!) But still, people might take the whole “slave” thing entirely the wrong way… even though it’d be about humans. Or I could just use them how I want in games with my friends in a thematic way and not trumpet it around on the internet like a dickhead. Either way, the Digga models are great… so looking forward to seeing them here. Found them the other day while cleaning up. So now I just need to finish the stuff that’s half painted and on the paint table first… They can also double as Chaos Cultists as needed as well. Splendid work as usual. The recipe for the robe – please share! Then blending back up through the above three VMC colours to bring the overall colour back up to a nice dirty-but-bleached finish, with Vallejo Game Colour 098 Elfic Flesh just used for the final edging highlight on the frayed robe edges, etc. Lurverly job mate, he’s spot on, and what a great range to pick from! Thanks Alex. The GM range had a lot of not-quite Orks in it as the Nelson plastics followed so closely, but a fair few choice pieces as well. Bruce Spence’s costume from the Road Warrior! I too have always been aware of Mad Max’s influence on gaming especially in the GW universes like Necromunda, Gorkka Morkka, Dark Future! … and so on. Also various models that take direct influence from the moves costume design and general imagery it creates! That said, I am a big fan of both Mad Max and the games/miniature’s that it has inspired! Thanks mate. 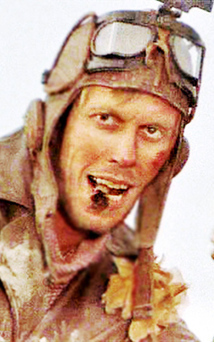 Bruce Spence is a classic Aussie actor, and of course he’s most iconic for his role as the Gyro Pilot. Gotta a love a bit of Bruce Spence. That Slaver is a fantastic sculpt, really done justice here. Lovely. Thanks Alex. It’s a really great piece of Nelson’s work, and as such as easy and very enjoyable to paint up. Pingback: RTB02 Space Ork Raiders Discipline-Master (1988) | Azazel's Bitz Box.